I've lived in Maryland for 7 years now, but being raised in the south means I'll never get used to this cold weather. Winter is coming, so turn on the fireplace, grab your blankets and more importantly, grab your bourbon! 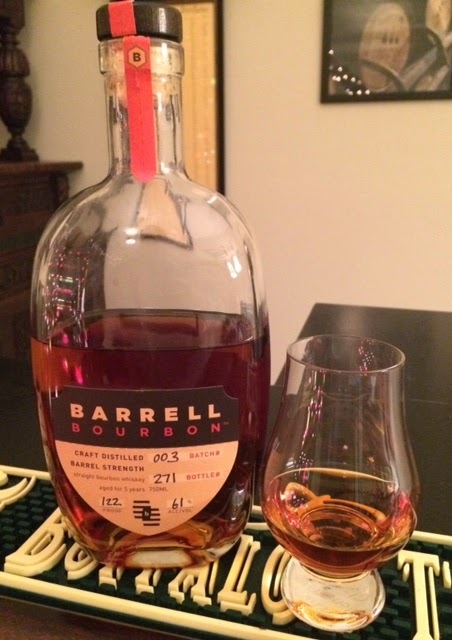 The third expression from Barrell Bourbon- Batch 003- shipped this fall and we were excited to get our hands on it! As mentioned in our previous reviews, these guys aren't distillers, but rather curators of fine whiskey out of New York, NY. Nose: It's a sweet nose full of sugar, creamy vanilla, and yellow cake. Baking spices, leather, and citrus round it out and add depth for a deep aroma. Taste: Candy corn and caramel combine for a sweet and chewy mouth feel. Similar to the nose, there is leather and tobacco present on the mid palate along with a sharp, peppery rye spice. Finish: Although this is a barrel proof expression, it finishes very smooth with caramel, oak, and rye spice. When Woodford Reserve announced the release of their 2014 Master's Collection- a straight bourbon whiskey finished in red wine barrels- I was left feeling frustrated (why not another experimental rye, hyperaged bourbon, or barrel proof?). Previous experiences with whiskeys such as Angels Envy and High Wests' Mid Winter Nights Dram (both similarly finished in wine barrels) have left me with poor impressions and a bad taste in my mouth. 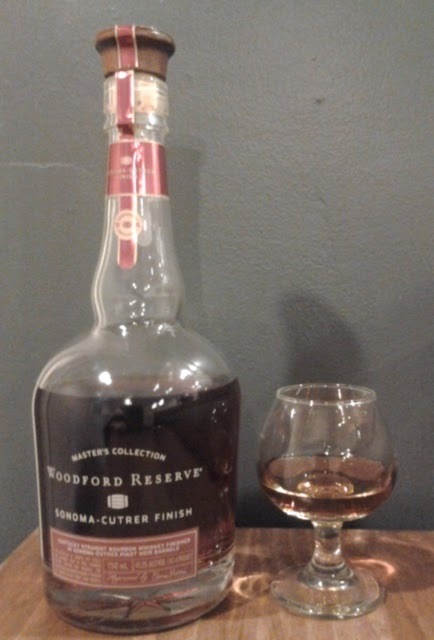 Nonetheless, I am a Woodford Reserve fanboy at heart, and when my brother-in-law told me he had gotten his hands on a bottle of this Sonoma-Cutrer finish, I was excited and hoped that this whiskey would be different. Nose: A blast of red fruits in the form of cherries, raspberries, and blackberries. In addition to some burnt caramel and oak, there is a heavy dose of baking spices in the form of clove and cinnamon. Taste: Consistent with the nose, this is an extremely fruit forward whiskey. Fruit punch, cherries, raspberries, and blackberries. Underneath are layers of spice and oak sweetness. Finish: Medium in length (though quicker than anticipated), with a warm, fruity and oaky character. Conclusion: I was pleasantly surprised by the quality and character of this whiskey. The fruit and spice characters compliment the other nicely to combine for a complex, warming, and fruit forward experience. My hat goes off to Woodford Reserve Master Distiller Chris Morris, as he hit the nail on the head with this release. Happy December Everyone! Today we have another hot ticket item for review- Pappy Van Winkle 15, Family Reserve bourbon. There are currently six different PVW whiskies (five bourbons and one rye). All PVW bourbons use wheat in the mash bill (instead of rye). The whiskey used to be produced at the Stizel-Weller Factory but is currently made at Buffalo Trace. 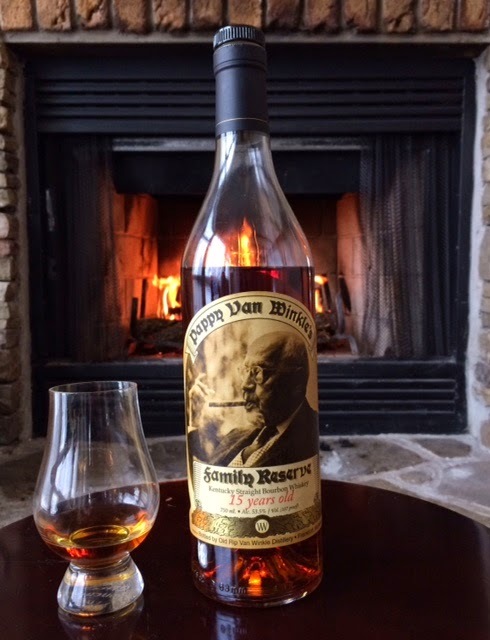 Julian Van Winkle III is the current company President, and his grandfather "Pappy" is the man smoking that nice looking cigar on the label. Nose: Vanilla ice cream and burnt sugars initially float out of the glass. Buttered popcorn, cocoa powder, and a slight nuttiness follow suit. A healthy dose of toasted oak, along with a slight pepper spice, combine for what I can only imagine will be a unique and well-rounded bourbon. Taste: At 107 proof, PVW 15 boasts a rich, chewy mouthfeel. Caramel popcorn, toffee, and marshmallow blend elegantly on the tip of the tongue. On the mid palate, there is graham cracker, cloves, black pepper, and freshly rolled tobacco. Finish: A medium, full-bodied, yet mellow finish. Sweet spice and heavy, dry tobacco linger. Conclusion: This bourbon makes me want to sit by a campfire and light up a cigar with great friends. The sweet tobacco finish is the highlight of this bourbon as it makes you want to come back for another glass. At MSRP, it's surely worth penny- if you can find it!